Should Yahoo Really Have Apologized to Google for Mocking Outage? When Google services go down, apparently no one wins. 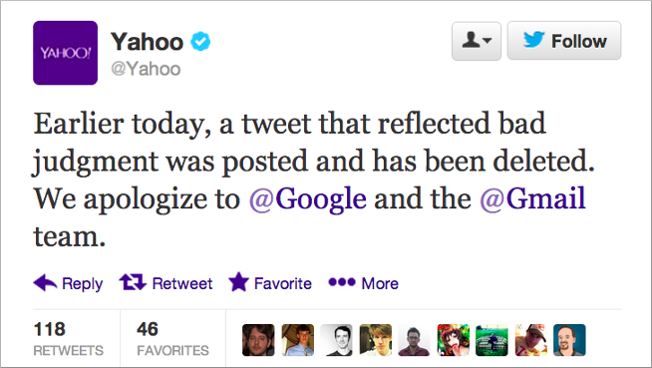 Case in point: Competitor Yahoo is being called a coward for deleting tweets that mocked today's global Gmail outage. "Earlier today, a tweet that reflected bad judgment was posted and has been deleted," Yahoo noted via Twitter around 4:30 Eastern today. "We apologize to @Google and the @Gmail team." While the original tweet simply said "Gmail is temporarily unavailable" with a screenshot of Gmail's access error, Yahoo put salt in the wound by continuing to tweet the same message at least four times in parody of the ongoing outage. Instead of being praised for a change of heart and good sportsmanship, Yahoo quickly felt the tide of criticism turn against the company. Some responses accused Yahoo of merely wanting to avoid looking like a hypocrite if it faces its own email outage in the future, while others simply said the retraction was "laaaaammme." Below you can see one of Yahoo's original tweets and some of the many responses to its apology.